Meet & Greet Author Event in Clark, New Jersey! Tickets are FREE. You can register and get your tickets here. 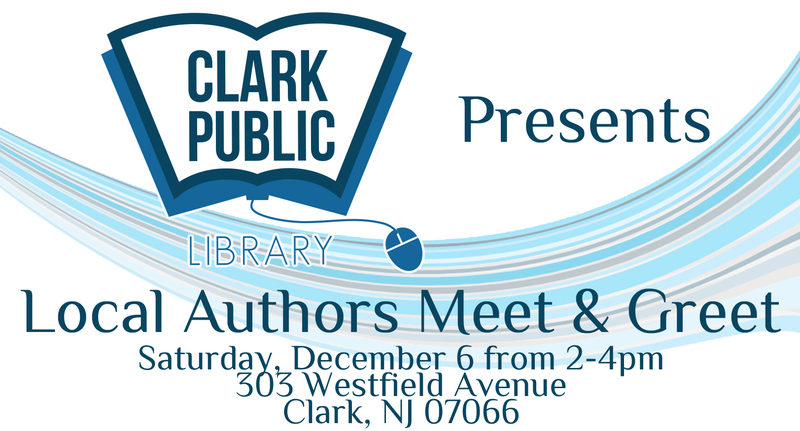 Clark Public Library will be hosting an Author Meet & Greet on Saturday, December 6, 2014 from 2 – 4 p.m. This relaxed, casual setting will offer readers, fans and book lovers alike time to meet and greet some of New Jersey’s, New York’s and Pennsylvania’s very own authors. Delve into the mind of an author who may just become a new favorite! Authors participating range in all genres from YA to Adult. This event is free to attend and open to the public. The authors will have signed books for sale so be sure to bring cash if you’d like to purchase one. When: Saturday, December 6 from 2 – 4 p.m.
You can connect with The Clark Public Library on Facebook and on their website.